Is this the Set and Forget Slow Cooker for you? I’m also going to share with you a braised pot roast recipe using this slow cooker in just a short while. But before that I’d like to discuss the cool features and benefits of this slow cooker. First, you can actually cook between three different modes for this slow cooker. The first cooking mode is the program mode. The program mode lets you set your cooking time and when the cooking time is done it shifts to the warm setting. Remember to cook at 145 degrees Fahrenheit or more for food safety. With the temperature probe mode, you insert this probe to the meat and sets the cooking time. Again, when the temperature is reached, it automatically switches to the warm setting. The last type of cooking mode is the manual mode. The manual mode is perfect for slow cooking roast beef, pork, meat and your favorite holiday recipes. It allows you to set up the desired temperature without any cooking time settings or limitations. You can switch between high and low temperature cooking with the manual mode. 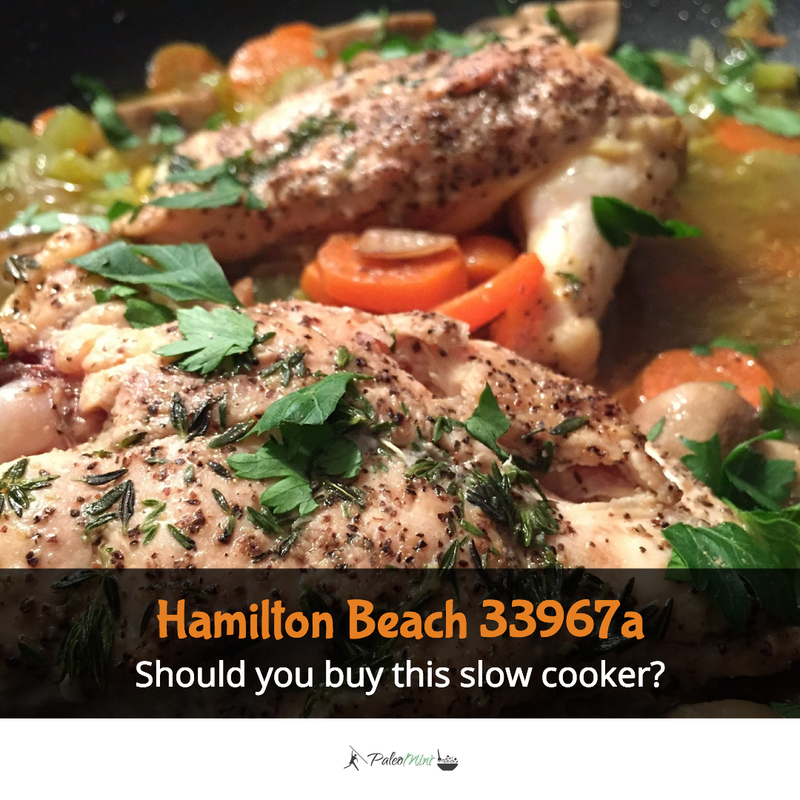 One of the most distinguishing features of the Hamilton Beach slow cooker is it the click lock lid feature. This is special lid cover prevents any leak when traveling or moving your slow cooker. This slow cooker also has wide handles. Having a wide handle is important because this slow cooker can be quite heavy when it’s filled with lots of food. 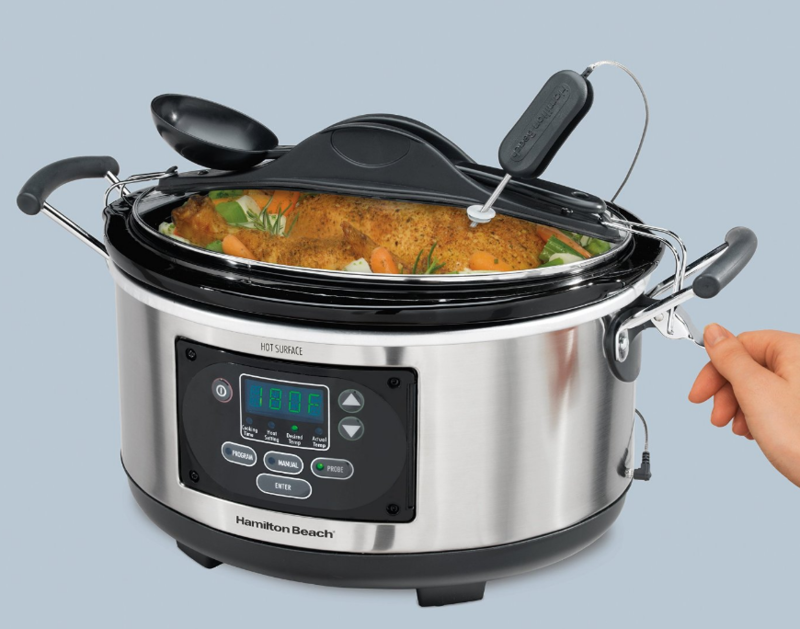 The Hamilton Beach slow cooker weighs about 15 pounds by itself. The dimension of the slow cooker measures about 16 x 10 inches. The 6 quart stoneware and the glass lid is dishwasher safe. That means the cleanup is very easy. You'll even enjoy this new programmable slow cooker more. This 3-in-1 slow cooker can be the perfect replacement for an old cooker for making those delicious and tender juicy meat recipes. You won't tire of using this slow cooker. 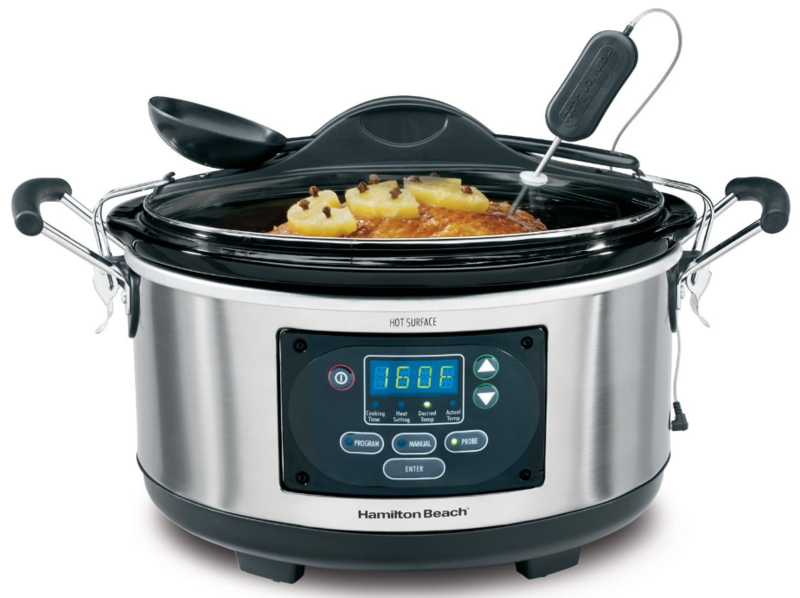 From beef stew to braised pork recipes, the Hamilton Beach slow cooker will be able to deliver great meals. Some people have reported that in order to create really tender meat cuts, they increase the temperature to about 190-200 degrees fahrenheit in the last hour or so. Even the cool features like the spoon holder and the clip-lock-lid feature is a MUST. Take note that some local stores like Walmart might sell the version without these features. Make sure that you get the slow cooker models with these two features from a reputable online store like Amazon. Now for some braised pot roast recipe with this slow cooker. Braised pot roast is a great family meal that you can serve during special holidays and occasions. So in today’s recipe I’d like to share one of my family’s secret recipes. First you need to make sure that you buy a good chunk of meat at your local store. When cooking a pot roast meal, you want to brown the meat first. Browning the meat will allow you to cook your meal perfectly. You can brown the meat using the Hamilton Beach slow cooker or you can brown it separately in a big pot roast. After browning the meat, you need to slow cook the chunk of meat with herbs and seasonings including celery, onions, carrots, thyme, rosemary, salt and pepper. Slow cook for 3 hours and once it’s done, allow the meat to rest for 10-15 minutes before cutting the meat. Allowing the meat to rest will help prevent the meat from being damaged when you cut through it. Before you buy your next slow cooker, check out the 5 best selling slow cookers for 2017 (according to their bestseller ranking on Amazon). That comparison will help you decide what's the best crock-pot for your particular needs. Here's the quick summary for all the features and benefits of the Hamilton Beach Programmable, Stovetop 6-quart Slow Cooker (there are 4,5,6, and 7 quart sizes). Looking for slow cooked recipes that are Paleo friendly? Check this out. If you're just starting out on the Paleo diet, start ﻿﻿﻿here. But if you're looking for the best Paleo cookbooks out there, I've created the top list for 2017.